In a recent Creamguide (Films) straw poll of saucy Mexican IRA comedy westerns, this came fairly near the top. Brigitte Bardot and Jeanne Moreau are blonde circus performers in turn-of-the-century Mexico who accidentally invent the Bucks Fizz skirt routine before hooking up with communist revolutionary George Hamilton. It’s a heady brew and no mistake! 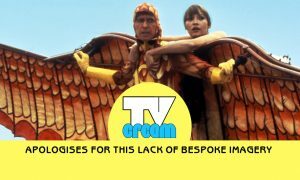 Kenny Everett-style sight gags, Good Old Days-style musical numbers and a light dusting of knockabout sixties satire from the usually far from daffy Louis Malle. I dunno, Louis did make Zazie dans le Metro, which is like wacky overload. This is a hell of a lot better than Les Petroleuses, where Jeanne was swapped with Claudia Cardinale. It is very “explosions are hilarious” – see also a lot of 1970s comedy films.